We often associate being productive with managing lots of tasks. We don’t say “no” to our teammates, we help them with their problems, we create long to–do lists and work our butts off to cross everything from the list. We shuffle between these duties and can’t keep our mind on one thing to finish it successfully. We’re nervous, we can’t make everything on time. Stop right there! Remember, we can do everything, but not everything at once. 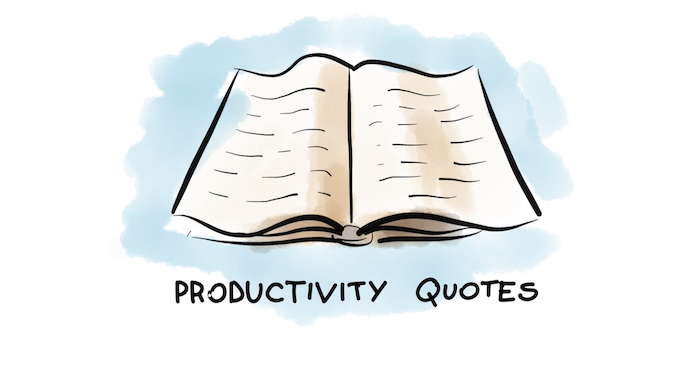 Here are a few productivity quotes – I explain them the best way I can to help you make your day productive. The Stanford researchers compared groups of people based on their tendency to multitask and their belief that it helps their performance. Here’s what they found out – those people who multitask a lot and feel that it boosts their performance were worse at multitasking than those who like to do a single thing at a time. It turned out that frequent multitaskers performed worse because they had more trouble organizing their thoughts and filtering out irrelevant information, so they switched from one task to another much slower. Trying to do two things at once is not a good idea because your brain lacks the capacity to perform both tasks successfully. There’s nothing worse than flailing between tasks. Not only you don’t do things well enough, but you also don’t find any joy in working this way. Multitasking doesn’t save you time but causes stress instead. We all know people who basically talk about their plans and dreams but don’t do anything to make them come true. The same people walk around the office and tell everyone how much work they have to do, instead of just doing it. They also don’t forget to publish a “Monday – I’m swamped with work” picture on Facebook, checking their likes every few minutes. In fact, all these people do is wasting time and procrastinating. At some point, you just need to get to work and start doing your job. Like creativity needs freedom, productivity needs discipline. You need to balance it. One way to make it work is to improve your focus. Get rid of all the distractions. Plan 2–3 hours each day to completely disconnect and focus on your work only. Working super focused has incredible results – once you’ll get into the flow (the state of your peak performance, where you are “in the zone”), you forget about the clock and everything comes to you naturally. When something interrupts your focus, your brain needs a while to get back at full throttle. When you’re not sure if you’re able to disconnect for a few hours a week, please let me know and I give you examples of CEOs of great companies who unplug for weeks and still make their business going. If they can do it, so can we. Sitting and waiting for an inspiration is like walking around and talking about your plans… It won’t get you very far. I get it, having a lot of work makes us procrastinate… Thoughts like: “I’ll do it after I check my social media”, “ok, after my coffee, or maybe second coffee” are rushing through our heads. To avoid this, start with doing a list of tasks you really need to accomplish. But don’t make it too long and complicated – who do you want to impress? Think about what you want to achieve TODAY. Think about your priorities. Be real. Estimate how much time you need to accomplish each task and best multiply it by 1,5 – just in case (we often underestimate our abilities for finishing a task). So your list has 12 hours now? That’s definitely too long. Coming up with tons of tasks makes an illusion of being busy. It’s not your priority. Get rid of the tasks which don’t get you closer to your goal. Now, all those that stayed are the most important tasks, and you should focus on executing them. But there’s also one more thing you can do. From the tasks on your list, choose the three, most important ones. These are your non negotiable priorities. No matter what happens, you should be able to finish them, at least those 3. This way, in case of any emergency during the day, you will know what you absolutely have to finish and you will be proud of yourself when you do. You couldn’t do that with 10 tasks. As a child, I attended music school four times a week after school. As I got back home in the evening, I did my lessons and practiced piano. I had very little time for myself, that’s why at some point I became a planning (productivity) freak. In the evening, I wrote down every minute of activities I suppose to have the next day (well, most of them). You know, I had to got up between 7:00 and 7:10, took shower 7:20, ate breakfast till 7:30, got dressed till 7:35, brushed my teeth and went out to school at 7:45. I transcribed a plan like this for the whole day. You may laugh but a plan like this helped me remember all the tasks and perform them quicker. At that time, each minute was precious for me and I was also excited to see if I can manage to perform all these tasks! It was like a game for me. Another benefit was for example that I knew how much I had to practice on piano to still have time for reading a book afterwards, knowing that I had dinner with my family in one hour. It seems complicated, but don’t treat it too literally. Kids have a stiff routine and none or minimum unexpected events during the day. When I tried to do it in my grown up life, it just wasn’t possible. Can you imagine, I planned to write back on emails for only 15 minutes? What if one day I got more emails as usual? Or that I planned talking to customers only for one hour? What if a case gets complicated? In the worst case, I’ll just leave work later or go to sleep later. For grown ups, planning every minute of activity can be used as a guide but not a stiff routine. We need to stay flexible. Otherwise we would be stressing out that we talked too long with someone at a coffee maker and won’t finish our jobs (still have that feeling sometimes). So, like I mentioned in a quote above, if you have one, two or three tasks that you definitely need to execute one day and some emergency happens, you could l follow through with these tasks and still call it a day. One smart person said that what made his company successful was not so much what they chose to build but all the projects they chose to ignore. They could focus on the most important products with the best people for the job. Sometimes, what gets you closer to your goals are not only the things you do but all the things you don’t do. The person who said that was Steve Jobs. I guess we can trust him with that.